Librarian, historian and writer, Diane's Master's thesis, "The Mormon Waldensians," Willow Creek Stake History and other publications may be downloaded. Diane has served as president of UELMA (Utah Library Media Association) and GLMA (Granite Library Media Association). 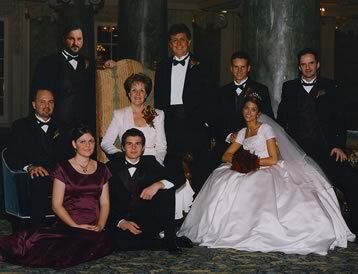 She and Tom are shown with Brian, Dean, Matt, Alex, Andrew Belov, Dave and Nikki Stokoe. Her hobbies are travel, energy medicine and the emotional component of disease.